Description: Recommended enhancement: Fighter. Grenadiers are specially trained soldiers chosen for their fearlessness and are often picked to lead special assault teams. They pride themselves on being the first person through the hole they just blew through the wall of an enemy fortress. Description: Fire a powerful, long ranged explosive round. Damage dealt is based on your weapon damage. You else apply a stack of Scorched to your target, which deals a small amount of damage and lasts 3 seconds. Description: Deals moderate damage and applies Blinded. Blinded reduces enemy damage and chance to hit by 20% for 15 seconds. Description: Deals moderate damage and applies Gassed. Gassed reduces enemy defense by 20% for 15 seconds and reduces enemy dodge by 20% for 15 seconds. Also has a 25% chance to stun for 4 seconds. Description: Reload your ammo and recover all your mana. Reloading disables your weapons temporarily, preventing you from attacking or using skills for 3 seconds. Description: Increase Damage by 10%. Description: Deals high damage (more if your enemy has Scorched), plus gives you secondary effects if your target is Blinded or Gassed. If Blinded, you Rally. Rally heals you over time. If Gassed, you Elude. Elude increases your Damage Resistance by 50% for 8 seconds. Secondary Effects last 8 seconds. Reactive Grenade can't miss and always crits. Description: Light damage, lowers enemy damage output for 4 seconds plus applies Weakened State. Weakened State replaces any other state. Description: Moderate damage, reduces enemy chance to hit crit plus applies Blinded State to enemy. Blinded State replaces any other state. Description: Moderate damage up to two enemies, reduces enemy haste and has a chance to stun for 4 seconds, plus applies Gassed State to enemy. Gassed State replaces any other state. Description: High Damage, plus has secondary effect based on whichever State was last applied to your foe. Weakened State secondary effect – Bleed causing Damage Over Time to enemy. Blinded State secondary effect – Rally causing Heal Over Time to to you. Gassed State secondary effect – Elude causing increased Damage Resistance to you. Secondary Effects all last 6 seconds. Description: Rarely, you see your chance to turn the battle in your favor. You give this attack everything you've got causing VERY HIGH damage to up to 2 targets! 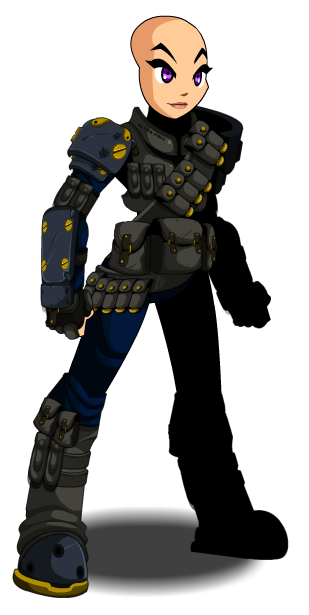 2018/12/14 Skyguard Grenadier revamp class breakdown. 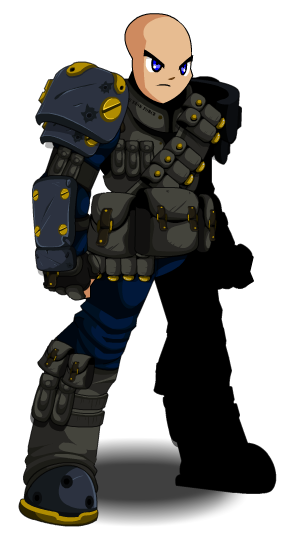 This class has the same skills as SkyGuard Grenadier (Non-AC). Thanks to Liy010, Gabrielbaran and Tendou no Mazo.